Cookies, T-shirt (or other option), and swag bag are included in the registration. Prizes, including a one-year supply of cookies for the top finisher, will be awarded - plus drawings for other prizes. Race photos will be available after the race. The race will take place at Como Lake. 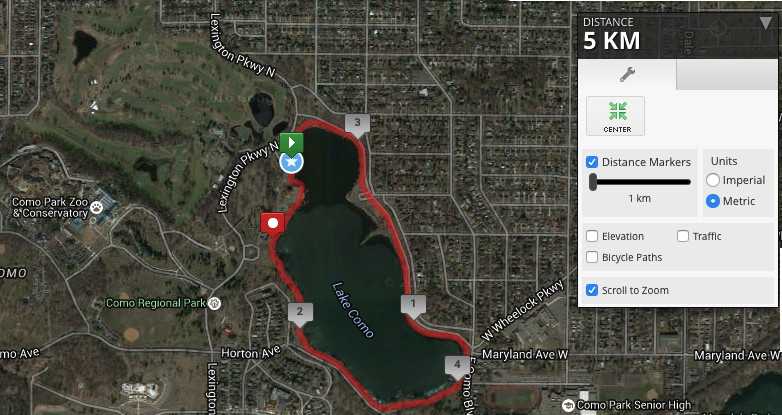 The route circles around the lake two times, starting and finishing near the historic pavillion. Check in is day-of only and starts at 7:30. Line-up starts at 8 with an 8:30 start. Free parking is available on either side of the pavillion off Lexington Avenue. 100% of profit from registrations goes to Hero Search, a St. Paul nonprofit that makes it easier for you to donate items and make an impact in the community. Race will be timed but not chipped to allow more to go to charity. We are partnering with Cookie Cart because their cookies are awesome and their mission to empower youth is even more awesome. Additional cookies will be available at the race for purchase - 100% of profits from cookie sales go to Cookie Cart. Because making an impact in our community is in our DNA, we are collecting donation items for other local charities. A number of charities represented on HeroSearch.org will be with us at the race. How was Cookie Fun 5K for HeroSearch.org? Hi there. Thank you so much for letting us know - we have just updated our page!